The Museum of Contemporary Art Australia, Qantas and Tate have today announced an unprecedented International Joint Acquisition Program for contemporary Australian art. 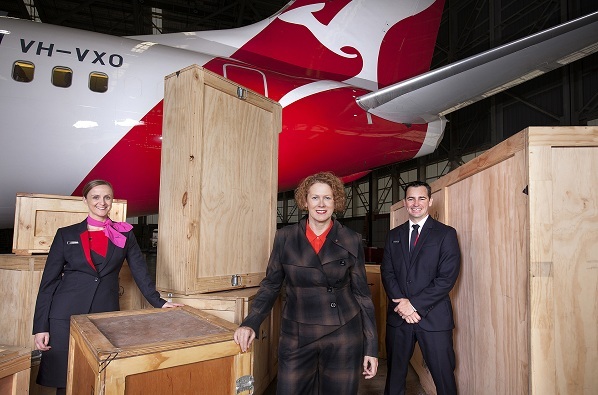 Made possible through a $2.75 million corporate gift from the Qantas Foundation, this ground-breaking collaboration will increase the international profile of contemporary Australian art as part of the national carrier’s role of championing Australia. The gift will enable an ambitious five-year joint programme through which a range of major works by contemporary Australian artists will be acquired for the collections of MCA and Tate, owned and displayed by both institutions. The artworks acquired will range across media and expected to date from the late 1960s through to the present. This will significantly enhance both organisations’ holdings of Australian art, while transforming the opportunities for international audiences to connect with contemporary Australian art and artists. Following the Qantas Foundation’s gift, the MCA and Tate will coordinate the research and acquisition of selected artists’ works. A selection of the first artworks acquired will be presented at the MCA in 2016, before heading to Tate. Qantas Group executive of brand, marketing and corporate affairs, Olivia Wirth, said: “As Australia’s national carrier we’re all about taking the best of Australia to the world. “We are excited to be working with two leading institutions in the MCA, and the Tate, to provide opportunities for global audiences connect with Australian art and artists. “Qantas has a long history of supporting the arts including the Flying Art series and Qantas Foundation Encouragement of Australian Contemporary Art Awards, and we are thrilled to be extending our contribution with this programme. The MCA and Tate will now begin their research with the aim of acquiring a number of major pieces over the next five years. Museum of Contemporary Art director, Elizabeth Ann Macgregor, said: “One of our core missions is to present Australia’s contemporary artists in an international context, stimulate dialogue and raise their profile on the global art scene. So we are very excited about what this collaboration means for Australian artists.